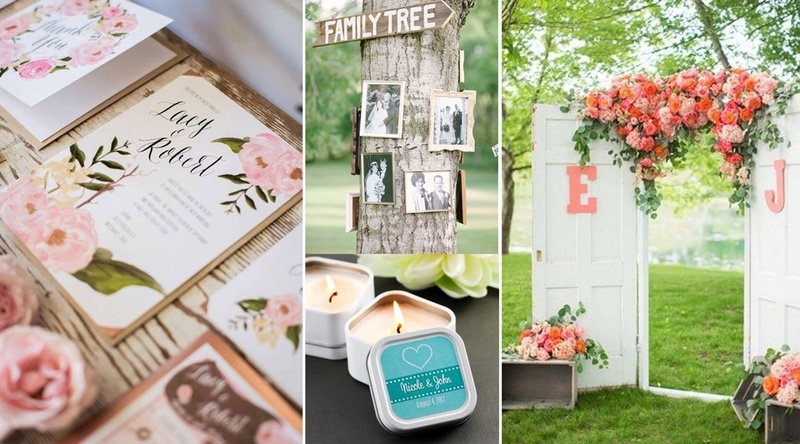 5 Great Ways to Personalize Your Wedding Décor, Props and more! Wedding décor perhaps takes up loads of our planning time. Picking the right colour schemes, props, drapes, lights, photobooth – the list never seems to end. We put in so much time, effort and energy into making our wedding décor stand out and be one of a kind. Personalizing your wedding décor is one sure shot way to do that – Think personalized caricature photobooth, polaroid photo décor and personalized napkins too! Taking your wedding to the next level with these aww-worthy personalized wedding décor ideas listed below. Quirky sign ages, caricatures and personalized standees are your way into making your wedding ‘You’! Our real couples, Vishwanath and Veda had a caricature themed wedding and used this theme to build their wedding photobooth, wedding cards and welcome standees too. While Riddhi and Sidd decided to use quirky signages that had cute song lyrics and Ekta and Sumeet went for banners that represented their bright beautiful Goa wedding perfectly! Polaroid pictures clipped on strings – it’s as simple as that! Go old school and print out pictures stored up in your picasa album. Showcase your best memories that double up as the sweetest wedding décor that carries a million memories with it! Our real bride Maitreyi did just that for her DIY Mehndi décor. Fairy lights, pom-poms and loads of old-school pictures hung up beautifully on strings. Our Real Wedding couple Saahil and Judy levelled up the wedding favour game with their personalized MnM wedding giveaways. They had their faces printed on one side with their names on the other, while Abhishek and Aakruti Khinvasara had their private jet personalized to perfection with their family logo. If you don’t want to go so extravagant, you can personalize your giveaways with notes, one for each of your guests. It’s time to get all of your quirky moments shown to the world through personalized t-shirts or sign boards. It could be an inside joke between you and your bae or simply an uber cool t-shirt to get that perfect #SquadGoals picture. Use the little elements to make your pre-wedding shoot a memorable one. Our personal favourite is this DhoklaWedsDaalBaati photo prop – so adorbs! For the most party of your wedding reception, your guests will be seated at their table. What better way to use this and personalize your table setting in the most instagram-worthy way. Add the names of your guests right on to the tables if you’re having a small intimate wedding or personalize your paper napkins with your favourite song lyrics or wedding hashtag! Click here to get your personalized wedding napkins at 30% off!